I believe I haven’t post this small cat painting yet. I did it some weeks ago of my daughter’s beloved cat. 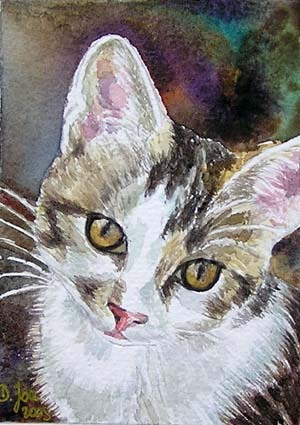 It is a watercolor painting in ACEO size (2,5 x 3,5 inch) on 140 Lb coldpressed paper. The challenge was to not use any masking fluid or to use any other tools to save the whites. I simply painted around the white. 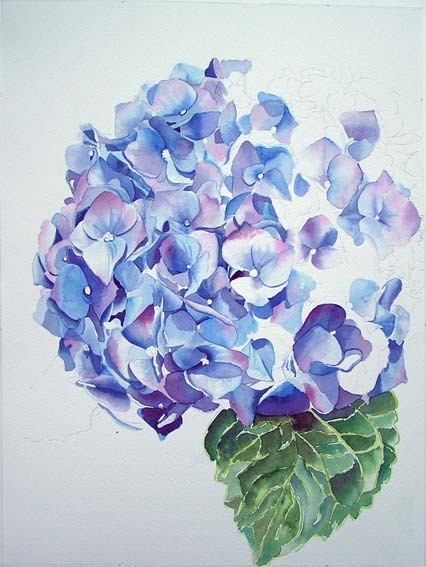 Currently I am working on another blue Hydrangea painting. Size is 12″x16″ on 140 Lb coldpressed paper. The blues and reds are created with Alizarin Crimson, Brillant Purple, Winsor blue (red shade) and Winsor blue (green shade). I am not really sure at this moment what to do with the background. Will post again soon.